Integrated Device Technology (IDT) took its time to reveal one of the more interesting energy-saving technologies at IDF 2011. 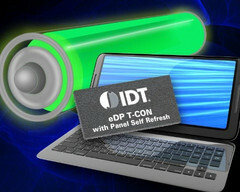 During Mooly Eden’s keynote address, IDT showcased its Panel Self Refresh (PSR) technology that the creators claim can potentially increase battery life by up to 45 minutes. The panel works in conjunction with a specialized Timing Controller (TCON), which stores the current static image locally in an integrated frame buffer. During this time, the display will refresh the static image from the local frame buffer instead of from the GPU, so the GPU is allowed to power down to a more idle state, at least until the next onscreen movement occurs. Essentially, the power savings comes from eliminating some of the workload by the GPU altogether. To prove its point, IDT even detached the connection between the mainboard and the specialized TCON during a static image, only to still see the idled image on the showcased display. As readers are probably predicting, the PSR technology will not be all that effective during gaming sessions or movie playback where images fly by quickly. It should, however, make a noticeable difference during web surfing or PowerPoint presentations when more static images are displayed throughout a time span. Our newest PSR-ready eDP timing controller helps our customers meet these [longer battery life] requirements, making IDT’s solution the ultimate high-performance, low-power interface for use in next generation notebooks, Ultrabooks, and tablets,” said vice president Ji Park of IDT Video and Display Operations division in the press release. Exactly when the technology will be implemented in laptops and its associated costs were not announced, but Intel is likely already a big supporter of the energy-saving technology, especially when it can potentially extend the battery life of future Ultrabooks. SAN JOSE, Calif.--(BUSINESS WIRE)-- Integrated Device Technology, Inc. (IDT®) (NASDAQ:IDTI), the Analog and Digital Company™ delivering essential mixed-signal semiconductor solutions, today announced that it has developed and demonstrated the world’s first Embedded DisplayPort (eDP) 1.3-compliant Timing Controller (TCON) with integrated Panel Self Refresh (PSR) technology for significant system-level power savings and extended battery life in portable applications. IDT’s new eDP timing controllers with PSR technology can save significant power when a static image is displayed on the screen of a system with a PSR-enabled graphics processor. Unlike traditional timing controllers that receive and process the display data continuously, IDT’s PSR technology identifies a static image and stores it local to the TCON in an integrated frame buffer. It then seamlessly displays the image from the local frame buffer allowing the eDP main link and a majority of the GPU functions to be powered-down, resulting in significant power savings. IDT’s latest solution incorporates novel design techniques and strategic process selection for the most efficient operation and seamless transition between modes. It is fully compliant with the VESA eDP v1.3 standard. eDP solutions offer the lowest system cost and longest battery life versus the LVDS solutions currently being used in portable embedded display applications. The large reduction in power consumption is key to accelerating the adoption of eDP in portable displays and the new IDT solution extends this power advantage. This new eDP technology is being demonstrated to qualified customers only. For more information, please contact your local IDT sales representative. To learn more about IDT’s broad portfolio of display products, visit www.idt.com/go/display.